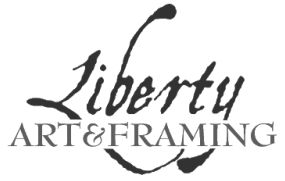 Liberty Art & Framing is a family-owned and operated business that began in 2011 under the name, Liberty Custom Frames. Owner, Laura Stolfi, works alongside her husband, Marc Stolfi, artist of Wrong Way Studio. In 2011, they opened their doors to a small frame shop and art studio located on the second floor of a century old building in historic downtown Torrington, CT. In 2012, the art culture in Torrington was on the rise with the installations and expansions of many art related establishments, including an upscale art gallery now known as Five Points Gallery, which was located just beneath the studio. In 2014, Liberty Custom Frames became Liberty Art & Framing, continuing to specialize in custom framing, as well as offer artwork and gift items from local artisans, including that of Wrong Way Studio. That same year Liberty Art & Framing expanded into a larger building nearby, formally and recognizably known as the old Squires Paint Store. Their new space offers close to 2000 sq. ft, (5 times the size of their original studio space), allowing the partnership to offer a wider selection of products, as well as services. Liberty Art & Framing is open Tuesdays - Fridays, 10AM - 5PM, and Saturdays 11AM - 3PM. They also accept framing jobs by appointment and can be reached at 860-618-7092. For up-to-date information/happenings, please visit and like their Facebook page: Liberty Art & Framing.